While he took a meteorology class in college, Stewart did pursue an athletic career after all, earning All-Conference honors for Penn State before playing for the Philadelphia Eagles, Cincinnati Bengals and Oakland Raiders. Drafted in the fifth round to kick off his first pro season, Stewart played in 115 games throughout his career, blocking and tackling his opponents and scoring touchdowns for his teammates and fans. It’s a career that is a dream come true for so many. But, as Stewart learned in the years following his departure from the NFL, his dream was still yet to be realized. After retiring from the NFL, Stewart founded Beyond The Locker, a not-for-profit organization dedicated to teaching life skills to young people and helping them find their purpose. 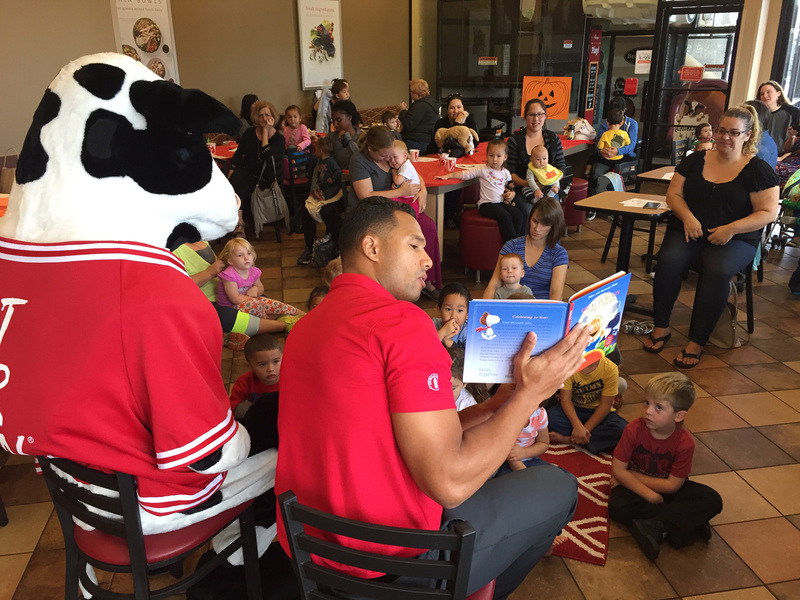 Through his work with the organization and other charitable efforts throughout the Bay Area, Stewart met several Chick-fil-A restaurant owners, including Dan Kosin, franchise owner of Chick-fil-A at Mowry Avenue. And that encounter sparked Stewart’s next big move. Ever the inquisitive student, Stewart says it was Kosin’s commitment to his employees and local community that piqued his curiosity and inspired him to work in the restaurant. After a few months working his part-time job, between squeezing lemons and hand-breading chicken, Stewart described something he noticed: thoughtful leadership. Hard work paid off, and now, Stewart is gearing up to open a restaurant of his own. He’s been named the new Operator of Chick-fil-A Bristol & MacArthur in Orange County, and he’ll start the new role on Feb. 1. That word “serve” is a theme throughout Stewart’s life. When he’s not working at Chick-fil-A, Stewart is continuing to make an impact on his community with Beyond The Locker. “I realized that my heart was about helping and serving people,” he says, reflecting on a self-discovery process he underwent after hanging up his helmet. That process helped him define his values, understand his roles and craft a personal mission statement to guide him forward. Stewart uses that same approach to help young people find their purpose. By using what he knows best – sports – Stewart teaches principles like teamwork, discipline and self-motivation to students. Beyond The Locker has coached thousands of students through an “I Got Skills” program for athletes, summer workshops and one-on-one mentoring. “If we can help kids better understand themselves, we can help them succeed by making better decisions and developing better relationships, so they can grow up to be better leaders in their communities,” he says.